Tesco Pay+ is a free payment app with lots of pluses. Make payments, collect Clubcard points and track your spending in any UK Tesco Store or Petrol Station with a single scan of your phone. 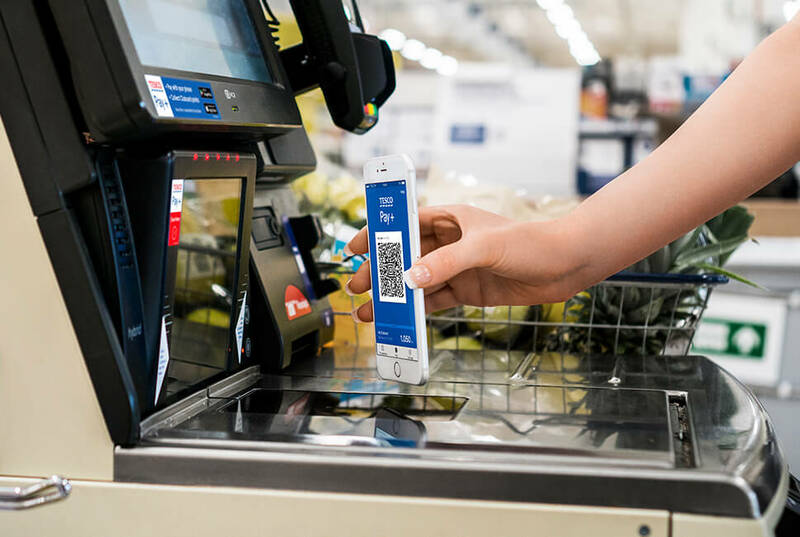 Tesco Pay+ is a mobile payment service that lets you pay for your shopping in Tesco and earn Clubcard points using just your phone. Not only that, but you can also redeem your digital coupons automatically when you pay with Tesco Pay+. So even if you forget your wallet or purse, it doesn’t matter, you can still pay! If you have a Tesco.com account, then you can just log in to Tesco Pay+ with your Tesco.com username (email address) and password. Your Clubcard number will be automatically linked from your Tesco.com account to your Tesco Pay+ account. If you don’t have a Tesco.com account, then we’ll create one for you when you register with Tesco Pay+, either in the app or here. If you’ve already got a Clubcard number, then you can enter this during the sign up process. If not, then we’ll give you a new Clubcard number automatically. How do I add my card to my account? When you sign in to Tesco Pay+ for the first time, you will be asked to follow the step-by-step guide to add your payment cards to your Tesco Pay+ account. You can either manually type in your card details or scan your card. To add a card at a later date, head to My cards in the app or on our site. You can use it in any UK Tesco store or petrol station. Is Tesco Pay+ safe to use? Security is our main priority and all card data is secured in our encrypted data centres – never on your phone. We ask for your username and password to access your Tesco Pay+ account online and to install the app, and you’ll then create a 4-digit PIN to access the app and make payments. Keep this PIN safe. No sensitive data is displayed within the Tesco Pay+ app and a payment can’t be made through the app using a card that has been blocked. We will also keep you safe by locking your Tesco Pay+ account if we suspect that any payments on your account may be fraudulent. Can I use my coupons and vouchers when I pay with Tesco Pay+? You can use all money off coupons and vouchers with Tesco Pay+. To use your Clubcard Extra Points or Double Points coupons, then you’ll need to swipe your plastic Clubcard, scan your coupons and then scan Tesco Pay+ – it’s a journey we’re looking to improve. *Clubcard points collected in each Tesco Pay+ transaction. £4 minimum spend applies. Clubcard points will be added to a future Clubcard statement. *The Tesco Clubcard Scheme is administered by Tesco Stores Limited, Tesco House, Shire Park, Kestrel Way, Welwyn Garden City, AL7 1GA, who are responsible for fulfilling points.